Carol, great post! I’m right now trying to unravel my taxes thanks to an informal partnership with another writer. She and I split both profits and expenses, but the PayPal account is in my name, so I’m the one who has to sort out the accounting. Oh dear, I hate those “informal partnerships.” They can be so complex. You could have formed a legal partnership and prepare a Form 1065 for partnerships, but most writers keep their businesses separate. They let one person claim all income and all the expenses (sounds like that’s you!). That person pays the other “partner” his or her share of the profit. I talked to Shawn Welsh who co-authored APE: Author Entrepreneur, Publisher with Guy Kawasaki. Shawn told me that they maintain separate businesses. Guy handles all the income and expenses and Shawn gets a check from Guy every quarter. Easy record keeping for Shawn. If Shawn has any expenses of his own, he can claim them on his own tax return. Here’s the tricky part: the Paypal account is all in your name, so have to report that total to the IRS (especially if Paypal send you a 1099MISC). You have to calculate the amount of a payment you give to your partner to settle up. If your “partnership” made a profit, you pay her. (You get to deduct as a business expense the payment you make to your “partner.”) If the “partnership” spent more than you made, she’ll probably owe you. Get it? I put partnership in quotes because in the eyes of the IRS and CPA’s you are not a legal partnership, but merely two separate business owners working jointly on a project. I really wish there were a better word to use than partnership to describe these working arrangements. Can my writing and editing be one business? 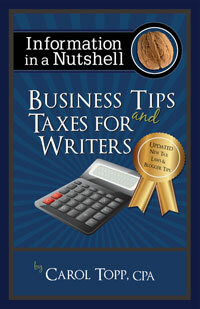 Kindle book: Does an author need to set up a business?